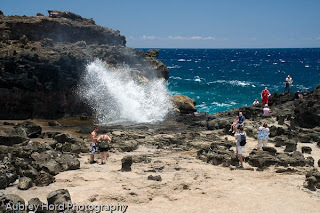 A few miles north of Kapalua on Maui, you will find a natural blowhole carved out by the Pacific Ocean that shoots water into the air at varying speeds depending on the surf conditions. 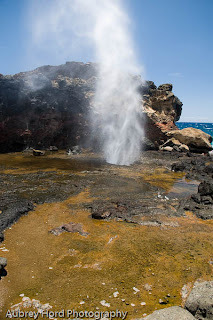 It is a fun adventure to take the short downhill trek to the coastline and watch the blowhole do its thing. It almost feels like watching a campfire - you just can't stop looking at it because you know any second it is going to go off again. When the surf is high, the blowhole it at its best, sucking water in and out through the opening in th e lava and shooting straight up into the air with an intensity that can make you keep your distance. It's like watching fireworks. Nature at its best! "It's a beautiful day on the iiiiisland..."